We are now into the final week and there seems like so much still to be done. At least the weather is holding up. It was not as sunny as it was over the week end – the day started out a bit overcast with a few drops of rain as well, but very calm. As the day wore on the cloud cover thinned and although the sun didn’t come out fully it was quite a warm and pleasant day. In Cutting 7 Lisa and Ciara continued the final clean-down of the surface to make absolutely sure that there are no further features there. Matt started work on lifting a piece of cranium we had noticed on Friday in the south west corner of the cutting, a little distance away from the grave cut. 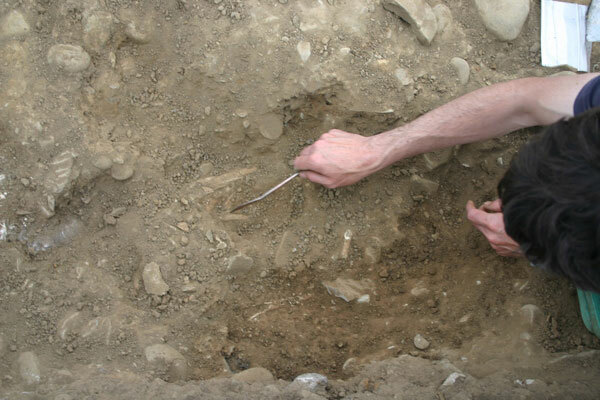 We had assumed that this was a fragment of bone disturbed from another grave but as Matt cleared more it became apparent that there were several pieces of bone in situ within the fill of yet another grave cut. This, of course, is not surprising because we already have found one grave, but it is not something we had planned, or hoped, to find. 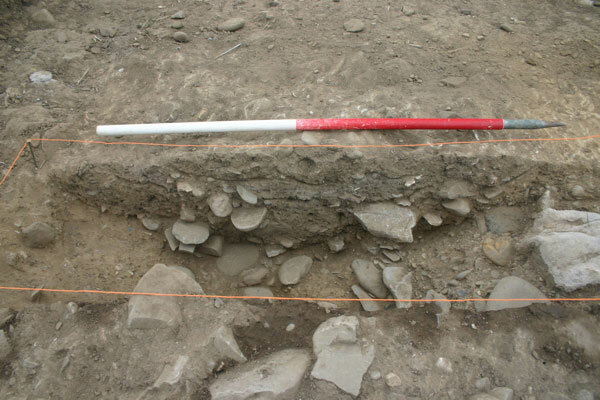 The work in this area will now slow down again considerably as the grave is carefully excavated and recorded. This is time we can’t really afford at this late stage. Human bone fragments and another grave cut. Matt bags up some of the bone. Darren working on his section. In Cutting 6 Eimear and Darren continued work on their respective sections and both were successful today in finding the western edges of the cut. In each case the edge was cut into quite gravelly material, very similar to that identified in the base of the ditches excavated last year. Ash, animal bone and charcoal are all frequent and at Darren’s end, there seems to be a lot of flint while at Eimear’s end there is an interesting socketed iron object, probably a tool of some sort, sticking out of one of the layers. Kevin had identified this as a location of some potential last week when he scanned the cutting surface with his metal detector. The next step is to identify the various fills visible in the vertical section face of each mini-cut and then to photograph and draw them up. In other news, we had a visitor today from RTE television – Philip Bromwell – who is doing a piece on how the archaeological profession in Ireland is faring in the current recession. This was a suggestion made by the professional body for archaeologists in Ireland, the Institute of Archaeologists of Ireland (IAI). 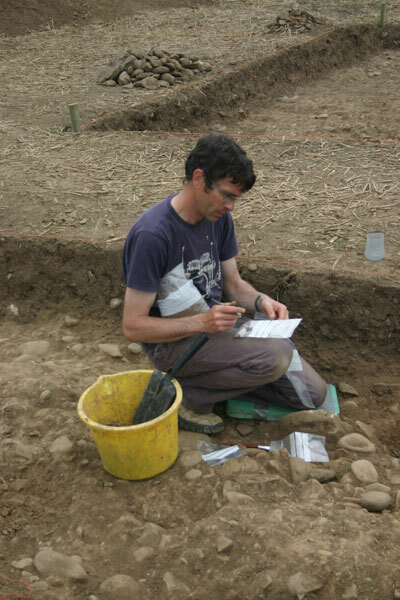 As well as filming the dig in progress and speaking about the stages in the research process leading up to the excavation, there was discussion of the many archaeologists who had been working in the profession who are now unemployed. 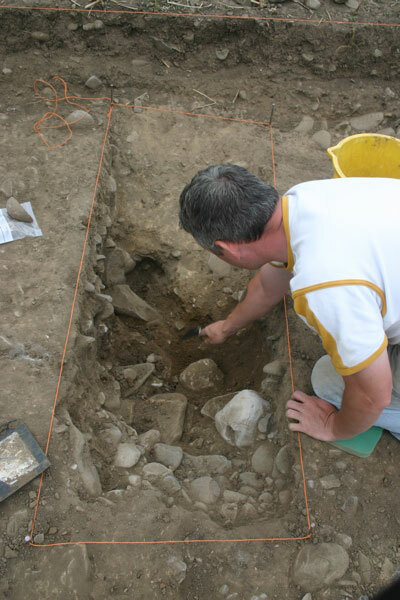 There was also some talk about the severe cuts in various research funds available for archaeological research like the Heritage Council’s discontinued Heritage Research grants or the INSTAR grants. The piece will hopefully air on the 6 One News later this week. I’ll let you know…! This entry was posted on July 25, 2011 by Conor Brady. 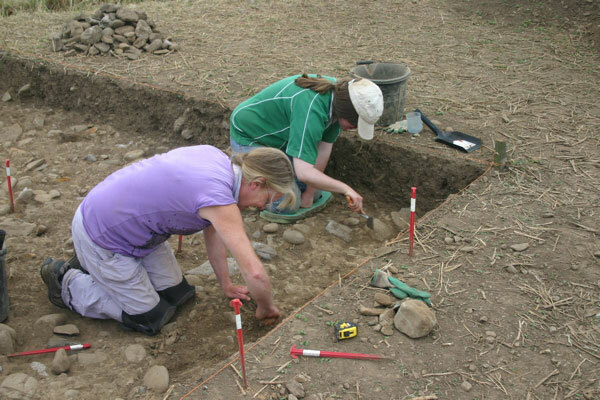 It was filed under Archaeology, Brú na Bóinne, Excavation, ireland, neolithic, River Boyne and was tagged with archaeological techniques, Archaeology, Brú na Bóinne, Excavation, Ireland, Rossnaree archaeological dig, Rossnaree dig.